When I was a teenager, my younger brother’s laziness almost spelled disaster for our family. After being asked to clean out the fireplace, he placed the ashes in a paper bag, and thinking that the fire had long been out, left the bag in the kitchen instead of taking it outside like he was supposed to. A few hours later my mom smelled smoke and found the source. The bag was slowly burning it’s way through the kitchen floor. It was extinguished quickly, and the insurance paid for a new floor that pleased my mom. That near tragedy was brought to mind after hearing about the terrible Christmas day fire in Connecticut. The fire that was responsible for killing the grandparents and 3 children and destroying the family’s home was started by improperly discarded ashes from their yule fire. By the time the fire department arrived, the Victorian was fully engulfed, with the 5 victims trapped behind walls of flame. After the cause of that fire was announced, news reports detailed the dangers of cleaning embers out of fireplaces and stoves, as well as tips for safely handling them. Last night, a family in Ferndale had a close call after not taking the proper precautions. Discarded ashes that were still burning were left where they started burning the house. Fortunately, as with my family, they were noticed before too much damage was done, and between the actions of the family and our department it was contained quickly. I’ve been surprised sometimes when I’m cleaning out our stove a day after we let the fire go out, that there are still warm embers buried in the ash. So after my experience in the 70s, I’ve always been very careful when disposing ashes. 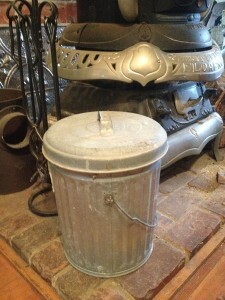 First, when cleaning out our stove, the ashes go into a small metal garbage can with a lid. I bought two of these a while ago. The second one is used for any rags I use with solvents in the garage to prevent against spontaneous combustion. After the stove is cleaned the garbage can is emptied in the garden in an area where I know it won’t burn anything. It’s simple and it doesn’t cost much money. But taking care of your ashes properly may save your home and your family’s lives. And of course it goes with out saying (I hope), your house should have a smoke detector in any room that is heated by wood, as well as detectors near or in all your bedrooms.